After years of an all-male Cabinet front row, the new Parliament that opens next Friday will see a gender breakthrough when Minister for Culture, Community and Youth Grace Fu will become the first woman to sit with the men in front. She is also Leader of the House. 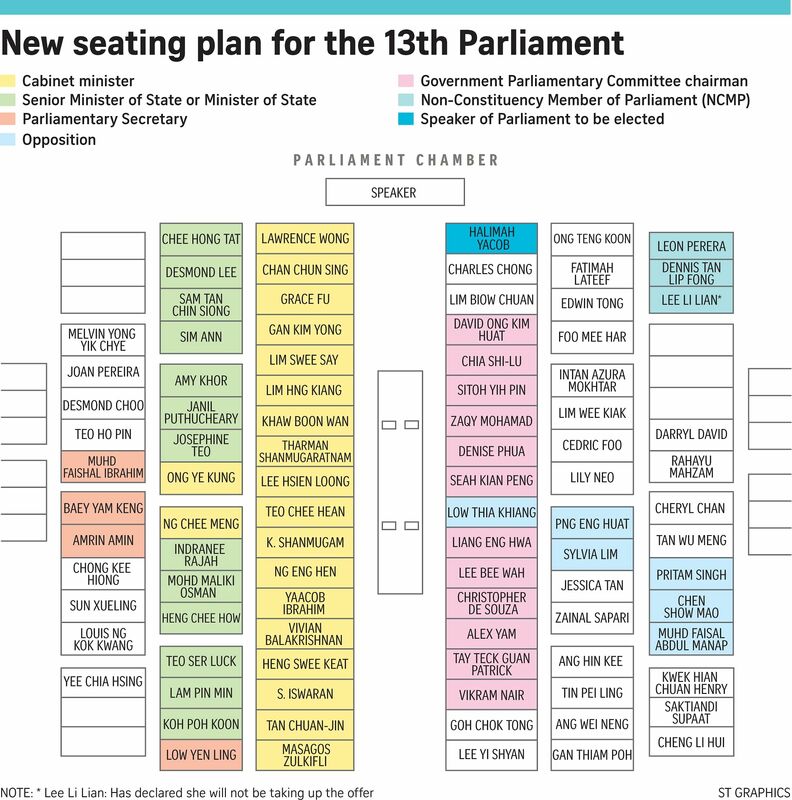 The expanded Cabinet of the new Government will also cause the front bench to spill over to the second row, according to the seating plan of the 13th Parliament sent to MPs last month. The two newcomer ministers - Acting Minister for Education (Schools) Ng Chee Meng and Acting Minister for Education (Higher Education and Skills) Ong Ye Kung - will occupy the second-row seats. The seating plan, reported yesterday in Chinese daily Lianhe Zaobao, also shows Prime Minister Lee Hsien Loong flanked by Deputy Prime Ministers Teo Chee Hean and Tharman Shanmugaratnam. Mr Khaw Boon Wan, Coordinating Minister for Infrastructure and Transport Minister, will be seated next to Mr Tharman. Workers' Party leader Low Thia Khiang's seat opposite Mr Lee's remains unchanged. Old blood is also making way for new, as younger government parliamentary committee (GPC) chairmen such as Mr Vikram Nair and Mr Alex Yam are being given the seats of veterans who retired from politics at last September's General Election. They include former deputy prime minister Wong Kan Seng and former national development minister Mah Bow Tan. The seat of founding Prime Minister Lee Kuan Yew, left empty after his death last March, will be filled by Mr Patrick Tay, chairman of the GPC for manpower. He said he had not expected it, adding: "I feel honoured to be occupying Mr Lee's seat." While Madam Halimah Yacob will be renominated as Speaker of Parliament, her deputies have yet to be named. In the 12th Parliament, the Deputy Speakers were seated closest to the Speaker and they were Mr Charles Chong (now Punggol East) and Mr Seah Kian Peng (Marine Parade GRC). Mr Lim Biow Chuan (Mountbatten) will take over Mr Seah's old seat. When contacted, Mr Seah hinted that he would no longer be a deputy, saying: "You will find out soon." He now chairs the GPC for social and family development and said a GPC chairman is usually not made a Deputy Speaker as well: "It's a bit complicated to juggle both positions. Not impossible, but difficult." Both Mr Chong and Mr Lim told The Straits Times they had not been informed if they would be nominated to be Deputy Speakers. The opening of the 13th Parliament will also start the process of drawing up a new batch of Nominated MPs (NMPs). Some from the previous batch of nine - whose 21/2-year term was aborted when Parliament was dissolved last August ahead of the election - want to seek a second term. They said that their stint of about one year was too short. But the shortest NMP term on record is a fortnight in 2001, when Parliament was dissolved for the polls. Said National University of Singapore historian Tan Tai Yong, who was an NMP in the 12th Parliament: "Parliament has a certain way of doing things and we were just learning the ropes. Given another year, with more experience, we would have been able to contribute to the debates in a more informed way." Mr Thomas Chua, president of the Singapore Chinese Chamber of Commerce and Industry, said of his fellow former NMPs: "A majority of us feel we would be able to contribute more if we had a chance to serve again."